Every Friday I attend my daughter’s school’s weekly Celebration Service. It’s an uplifting end to the week, focused on highlighting the children’s achievements. It’s a completely different experience to the whole-school assemblies that kick-started every school day in my own childhood. Each one followed the same formula: two hymns, one prayer, and bashed out on an upright piano a roaring tune to which we marched in and out. Almost as popular, because its words were dramatic and it had no high notes, was “Eternal Father, strong to save”. One of my friends liked that one so much he planned to have it at his wedding. In my innocence, I thought of this hymn as a history lesson, as if losing fishermen at sea had gone out with the Ark. After all, I didn’t know any fisherman who had drowned. Living a long way from any seaside, I was about as likely to meet a fisherman as I was to meet a saint. Seafishing is the most dangerous peacetime occupation in the country. Even the most modern ship does not render fishermen inviolable, and plenty of fishermen ply their trade in less sophisticated vessels. When fishermen lose their lives, their bodies may never be found. This creates serious financial problems for their surviving dependents, while insurance companies dither, unwilling to declare them legally dead in the absence of certain proof. Who knew? I now feel even more disgusted than before with “Canoe Man” John Darwin, the notorious fraudster who faked his own death at sea in order to start a new life with his wife in Panama with his life insurance money. How dare he? The Fishwives Choir is a dignified and determined group of women who have lost husbands or sons to the sea. They came together earlier this year to make a beautiful and poignant recording, intercutting “Eternal Father, strong to save” with the northern fishermen’s nursery rhyme “Dance to Your Daddy”. In the final chorus, the expected last line “when the boat comes in” is omitted, subtly reminding the listener that for some fishermen’s children, Daddy’s boat never does come in. All profits from the CD will go to The Fishermen’s Mission, which offers support to lost fishermen’s dependents. So next time you tuck into a takeway or break out a Birdseye box from the cuddly polar bear’s clutches in your freezer, spare a thought for the men who have indirectly served you your Friday fish supper. And I’m not talking about Captain Birdseye. Listen to The Fishwives’Choir and while you’re at it, please consider downloading the song from iTunes. You’ll find it’s as cheap as chips. For more information and to order your copy, visit The Fishwives’ website. To find out more about The Fisherman’s Mission, click here. I loved this – both for those hymns from Songs of Praise (my school’s hymn book too!) and for your wonderfully sobering thoughts about the fishermen We eat a lot of fish, and, we holiday in West Cornwall, where there are still fishing boats (quite small ones) plying their trade from the many small harbours, including Sennen where we stay. It’s a sobering thought, the lives those men lead.Your post here makes me feel should find out more about them. We have many coastguards, and seamen, in both our ancestral families, but live in the middle of England far away from the waves. Thanks, Debbie! I love Sennen Cove – what a magical place it is. How interesting that you have such a strong fishing/coastguarding heritage in your family – you should be very proud of them. If you’re ever up in the NE of Scotland, I recommend the Scottish Fisheries Museum (I assume there must be an English one somewhere but I haven’t found it yet!) – it would be a great place for you to learn more about the history of fishing. Also the lighthouse museum at Arbroath was absolutely fascinating. Thanks for commenting! …God only wise, in light inaccessible,hid from our eyes, Most blessed, most glorious, the ancient of days, Almighty, victorious, thy great name we praise.” Still in my head though I haven’t sung it for decades. I might not always have understood what the words of hymns meant, but the stayed with me. I remember using the word “ineffable” once in an essay at the American high school I went to, and the English teacher thought I’d made it up. Ha! Pagan! “When through the whirl of wheels and engines humming” was another favourite – almost as good as “Jerusalem”, the headmaster’s favourite, sung every Tuesday at hymn practice. Happy days! This is such an interesting post, Debbie. I remember when I read The Perfect Storm a few years ago, I replayed some of those events over and over again. It was my first kind of insight into the fishing world of Canada’s Maritime provinces, and yes, a difficult and dangerous one at that. Thanks for sharing your experience and I love the way that it’s come full circle for you! I have never read the book, Laura, but I saw the film (a DVD of it came free with our first ever DVD player!) and found it very moving. It is frightening how detached the average person is from the perils of the fishing industry, and I wonder how it ever exists at all, really – how can we want to eat fish so much that it’s worth risking people’s lives for? But I guess for many it is an industry, it is a job, and especially attractive in places where there aren’t many other jobs up for grabs. Sobering. Thank you for a very moving post, Debbie. It certainly made me think. Thanks, Carol. 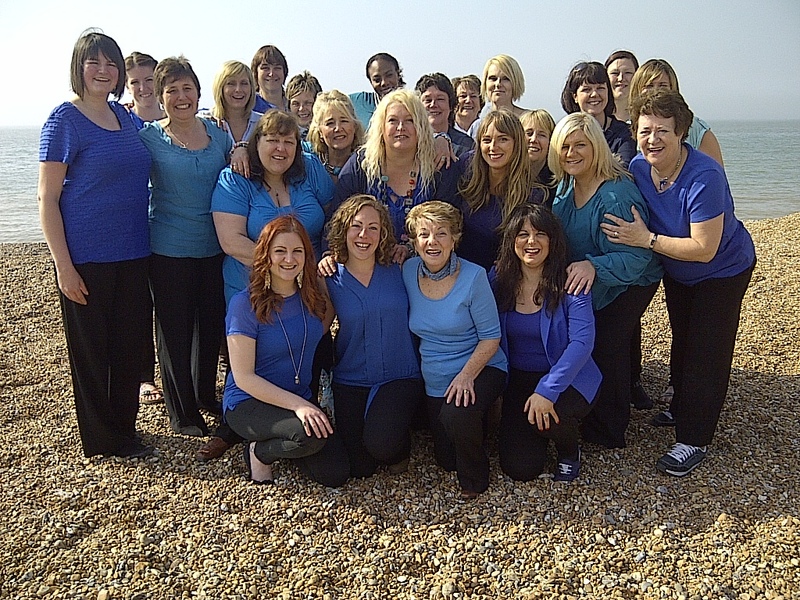 I found the whole experience of finding out about the Fishwives Choir very humbling. So glad to be able to help spread the word for them.